It’s official: my love for coconut oil knows no bounds. For years, I’ve been singing its praises for its endless health and beauty benefits. From a skin moisturizer to hair conditioner and teeth whitener -there’s seemingly nothing this natural wonder can't do! What I didn’t know however, is that there’s a new beauty line called Skinny Co. that’s changing the coconut game. What’s so special about them you say? Well, Skinny Coconut Oil is the only 100% raw, alkaline coconut oil on the market today. That means the cold-pressed oil from the wild harvested coconuts they handpick from the jungles of Vietnam is never heated, and truly tree to table! Still not impressed? All of their beauty products have five ingredients or less with no chemicals, no fillers, no preservatives, and are non-toxic and edible. Their patent pending process takes 3x as long and uses almost 3x more coconuts (12+ coconuts per 16oz jar) than the industry average process, which means they’re delivering to you the only 100% pure, raw, alkaline coconut oil! What’s more, they offer an entire collection of coconut oils to fit your every need. From facial oils, to raw soap bars, and sugar scrubs they’ve got you’ve covered. I couldn’t wait to get my hands on their products and try them out myself. I agreed to test out their small jar of facial oil, sugar scrub, regular coconut oil, oil pulling, and body butter. First of all, I loved how convenient the 2oz jars were. In fact, I was able to take them on vacation with me to Maine! The sugar scrub and coconut oil were lifesavers for my daughter’s dry lips and hair, while the body butter did wonders to soothe and heal our sunburns. The facial oil was ideal for a quick and easy makeup remover, even on my stubborn waterproof mascara! 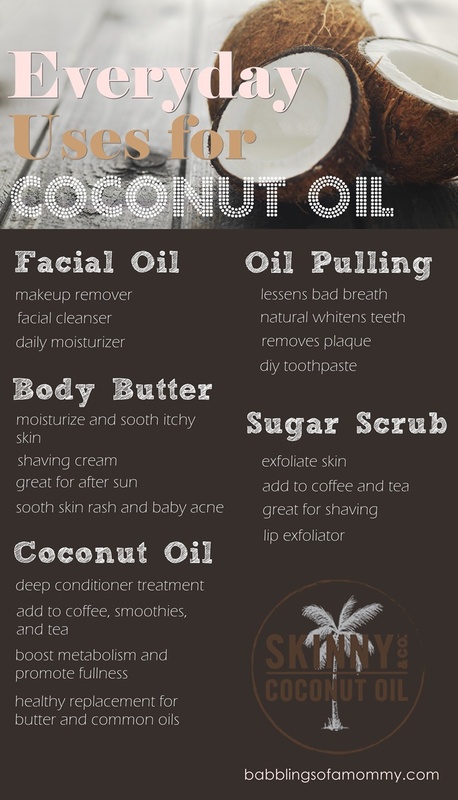 But the most surprising product I loved was the oil pulling. It’s infused with peppermint oil and is quickly becoming part of my oral hygiene routine. Skinny Co. products are available online at skinnyandcompany.com, Amazon, and Sephora (Canada only) with prices ranging from $8-36.